Donnie made an appearance along with the Jabbawockeez at Jet nightclub in Las Vegas. See photos here. According to nkotb.com Access Hollywood will feature NKOTB Cruise coverage on today's show. Check local listings for airtimes. The guys raised $200,000 for Susan G Coleman Foundation last night. Getty Images has a bunch of photos from last night here, and Wire Image has some here. Due to unforeseen production delays, the summer New Kids On The Block tour has made necessary changes to the tour dates and venues. The new tour schedule is listed below. If you have questions regarding your specific show, please contact your local venue who can issue refunds if necessary or provide more information. THU 6/25/09 Detroit, MI DTE Energy Music Ctr. 'It's a blessing,' NKOTB's Donnie Wahlberg says of forthcoming tour. When the New Kids on the Block hit the road this summer, starting May 15, they'll be bringing along with them a masked dancing troupe as their opening act. That troupe is none other than "America's Best Dance Crew" vets, the Jabbawockeez. And, believe it or not, the New Kids are learning just as much from the Jabbawockeez, if not more, because they are still so fresh-faced — well, actually, masked. "It's a blessing," Donnie Wahlberg told MTV News on Thursday (May 7). "In their eyes they're coming out on the road with an established act, but they're superstars to us." He added that much like the NKOTB the Jabbawockeez come from humble origins, and he likes that they're living out their dreams the same way the New Kids are, more than 20 years after their commercial heyday. "There's an appreciation," he said. "And we're all out there living our dreams." Fellow New Kid Joey McIntyre agrees with his Beantown homie. He thinks that working with a group of guys who are so green to fame and celebrity has made them understand how awesome it must be to be out there making girls scream. "They have a great spirit," he said. "They know how to work the crowd. There's a happiness to it." In addition to learning how to once again appreciate how fun performing can be they also have taught the guys a thing or two about teamwork. "And they're all wearing masks," he continued. "You can't get more team than wearing masks. It's all for one, and that's what being a group is all about." Here's another video from Donnie! Is Donnie Wahlberg psychic? We'll find out as the Celtics make a run for banner 18. Wahlberg's prediction: "First of all, they're gonna beat Orlando in five or six. Then we're gonna hope that K.G. comes back, and even if he does, Cleveland is gonna be really overconfident. . . . We're gonna steal one of the first two in Cleveland, then LeBron's gonna sprain his ankle and the Celtics are gonna beat them in five. . . . Then we gotta see if we can beat the Lakers. We gotta get me back in LA and have me like, uh, take Phil Jackson's hearing aid so he can't coach the Lakers properly. Then we can win the whole series. I think we can do it." So do we, Donnie, so do we. . . . Wahlberg has been pitching positivity all over town these past few days. He spent Saturday at the Garden rooting on the gang in green. Sunday, he hosted a party at the Hard Rock Cafe for local hip-hop artist Jimmy Marsh, the first artist signed to Wahlberg's Donnie D record label. Guests at the party included fellow New Kid Jordan Knight, UFC pinup Rachelle Leah, who told us she's been friends with Wahlberg since the two met in Vegas a few years ago. Wahlberg finished the good-will tour by surprising all 63 students at the Mother Caroline Academy in Dorchester with tickets to the New Kids on the Block show in June. "There was a lot of screaming. I've had a headache all day," joked Beth Griffin, the school's director of development. 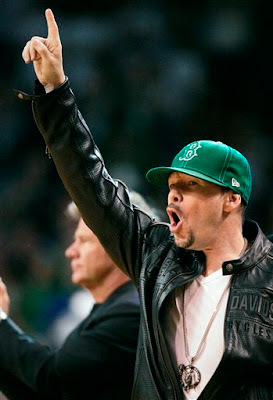 Wahlberg was connected to the school through hedge fund hotshot (and Celtics co-owner) Jim Pallota, an academy donor. For those that are curious, here is the link to the cruise itinerary. Here is a video from Youtube of Donnie and Jimmy March performing at the Donnie D Launch party last night.